Does it happen when someone is trying to submit your form? Can you please provide us with a link in question? We will need to reproduce the issue, and then we will be able to escalate it to our Development Team. Only happens when embedded in email. Live form works. First Come - First Served! These spots will fill quickly! Hello MISD Employees! Here's the ONE EMAIL OPPORTUNITY that I talked about during my Budgeting & Planning for Emergencies Seminar for a COMPLETELY FREE 60-MINUTE FINANCIAL COACHING SESSION. We'll look at your budget, talk goals and address any other financial questions you might have. Remember, I promise no hard sales, and I don't sell insurance or investments! I look forward to helping! What would you specifically like to address during your complimentary session? Obviously, above paste didn't work. I sent a separate email to tech support. It seems that you have embedded the source code in the email. As I tried to submit the form from the email you've sent, I was able to submit it normally. Since you were able to siubmit the form using direct URL, the issue could be with the newsletter app that you are using. Could you let us know which email newsletter that you are using? Please be noted that embedding source code directly on an email is not recommended due to any conflicts with the email inbuilt scripts that might result in malfunctioning the form. Instead you may try embedding using iframe if the newsletter is supported or a direct link. Okay. Sorry, I overlooked about the newsletter app. 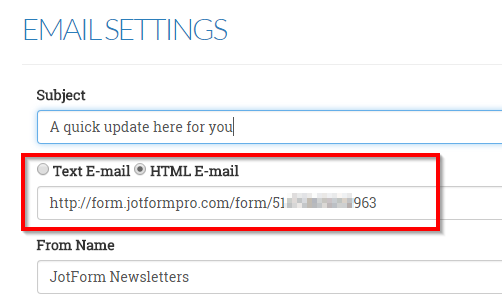 I see that you are using JotForm Email newsletter app and providing the direct link to the form in Email settings. Let us know if you need any further assistance. Thank you! Clearing the browser cache did not work. Are you able to set up a Go To Meeting or Skype for some one-on-one support? I am sorry to inform you, but we only provide assistance via this support forum and email. The HTML E-mail option is expecting to receive a link to prepared email template instead of the raw HTML code. It means that we cannot use the actual form link as the HTML email template link.